Second Church of Dorchester: Codman Square landmark. Clara Hudson photoA lot is happening in Codman Square. For example, the Dorchester Winter Market now is open every Saturday at the Great Hall. I went there last week to procure locally produced foodstuff, including organic veggies, kielbasa pierogi, French baguettes, and a slab of chocolate cake to die for. My visit happened to coincide with a casual theater event. Actress Valerie Foxx was in character as Colonial Boston’s Phillis Wheatley; she mixed with the crowd, reciting wondrous poetry and telling the extraordinary story of the slave girl who became a great writer. That was followed by another chance encounter, my first introduction to community-shared solar power. A representative from Codman Square Goes Solar was in the Great Hall to shine a light on the subject and sign me up for a workshop. The idea was hatched across the street at Second Church last year when church members were looking for ways to reduce operating costs. From there, the Boston Interfaith Community Solar Project was formed, and now Second Church is going solar, and Codman Square Goes Solar is offering to provide solar panels to the surrounding community. 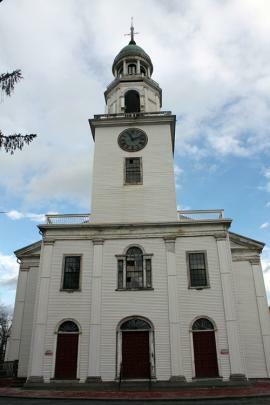 Second Church is the real thing, a gem of New England period architecture built in 1806. The rough-hewn outline of the building is weathered and worn, but it stands with great majesty amid the clamoring traffic, a grandiloquent vision rising to portentous size like a mighty wooden sailing ship tethered to its time. The distinctive shape of the lantern atop the Second Church steeple is a prominent feature that is visible on the horizon from many points around Dorchester. Now, in close proximity to this steeple, which houses a Paul Revere Bell and the four-dial clock gifted by Walter Baker in 1852, the church roof will be overlaid with solar panels. So the venerable Second Church is leading the way, and the Codman Square Neighborhood Council and the Codman Square Neighborhood Development Corporation (NDC) are facilitating Boston-based solar developer Resonant Energy’s efforts to bring Codman Square Goes Solar to area residents. Resonant Energy provides solar arrays at no cost. In return for a rooftop lease, participants receive maintenance-free solar roof panels, the installation of which promises savings of up to 30 percent on energy bills. While the program is set in Codman Square, anyone from Dorchester can apply. Usually, solar companies stay away from flat roofs; their model services the single- family home in the country, not three-decker rooftops in Dorchester. But Resonant focuses on historically underserved communities that do not fit the mold of solar clients. The company runs open workshops for solar training as part of a campaign to identify a bundle of homes interested in going solar. They are aiming to get 25 homes ready by the middle of this month. By installing solar panels on many homes at the same time, they can keep costs down. The challenge is to divide benefits among landlords and renters. Instead of making lease payments to you in cash, Resonant Energy pays you with solar electricity produced by your roof’s system. The power that doesn’t go to you is then sold to community-based nonprofits. One important component of this enterprise is the increased visibility of clean energy within the neighborhoods. It gets the word out – a meaningful step in the struggle for information and inclusive access to opportunity. Clean energy is a part of 21st century economics. We have to innovate ways to get the community involved to ensure that ordinary voices are not being excluded from the policy-making process. Community-shared solar power helps to bring energy equity to those who need it the most. Codman Square Goes Solar is the type of pro-active planning that meshes gears with the Talbot Norfolk Triangle Eco-Innovation District. The TNT-EID is Boston’s first eco-innovation district. TNT is west of Codman Square between Talbot Avenue, Norfolk Street, and New England Avenue (along the train tracks). Here are the numbers: 13 blocks; 46 acres; 252 homes; 525 housing units; 1500 residents. (1) Energy retrofits (existing structures). The goal is to save money – over 50 percent of the homes in TNT have now been insulated to prevent heat loss. (2) Transit Oriented Development (transit equity). Some 40 percent of people living near the Fairmount Line work downtown. In the next six years more than 100 units of affordable home ownership or rental will be built. (3) Solar (rooftop). Generating solar power and sending it back to utility gains credit for residents. (4) Green Infrastructure (street trees, rain gardens, bike lanes, traffic calming). This helps to implement the city’s Vision Zero goal on serious crashes and traffic fatalities. TNT is one of two sites in the city piloting the Boston Traffic Department’s Slow Streets program. “LEED” stands for Leadership in Energy and Environmental Design, a US-based rating system that integrates the principles of smart growth, urbanism, and green building into a national system for neighborhood design. The Codman Square NDC is aiming for a Platinum designation from LEED-ND (ND stands for Neighborhood Development), the highest possible rating for planned efficiency standards. Designations will be known by summer’s end. In addition to Codman Square Goes Solar, the Codman Square NDC is putting solar on 18 of its buildings, some of which will produce more electricity than needed. That excess power will go to low-income residents in those properties, further reducing their cost of living. One thing not mentioned above is the 20,000-square-foot urban agriculture site on Ballou Avenue. In the past two years, 1,000 pounds of organic produce have been grown there for the Codman Square Farmers Market. Everything happening here is part of a systematic effort toward greater sustainability, affordability, with no displacement, more access to jobs, and a greener, healthier environment for the people who live here now. In recognition of the Eco-Innovation’s District progress and potential, the Codman Square NDC was honored by Mayor Walsh’s Greenovate program in late May 2014. Theirs is a replicable model for other communities to leverage existing assets to improve quality of life. We can take a moment to thank them for showing the way, but there is no time to rest. The rate structure for solar energy now in place discriminates against community- shared solar projects like Codman Square Goes Solar. Low-income communities and individual homes suffer the most for being in the “least organized” category. The community-shared solar constituency is no match for large commercial solar farms. The Holmes Bill (an act relative to solar power in environmental justice and urban communities), now being sponsored by state Reps. Russell Holmes and Michelle Dubois and state Sen. Sonia Chang-Diaz, is designed to restore balance to the equation. Sign up for Codman Square Goes Solar at Resonant.Energy/signup; For more information, contact Becky Wasserman at Becky@Resonant.energy. Valerie Fox as Phillis Wheatley: Last performance for Dorchester Winter Market at Great Hall on Sat., Feb. 4 (10 a.m. to 1 p.m.).